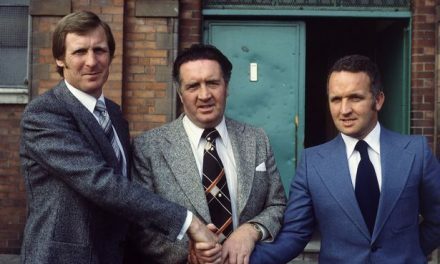 On 9th April 1988, Celtic were in a great position during their centenary season. They required one mere point to win the league title, which was a formality given that there were four games remaining and they also found themselves in the semi final of the Scottish Cup. On the day, Hearts provided the opposition at Hampden and brought a big support to Glasgow as 66,000 fans packed into the old national stadium in anticipation to watch. 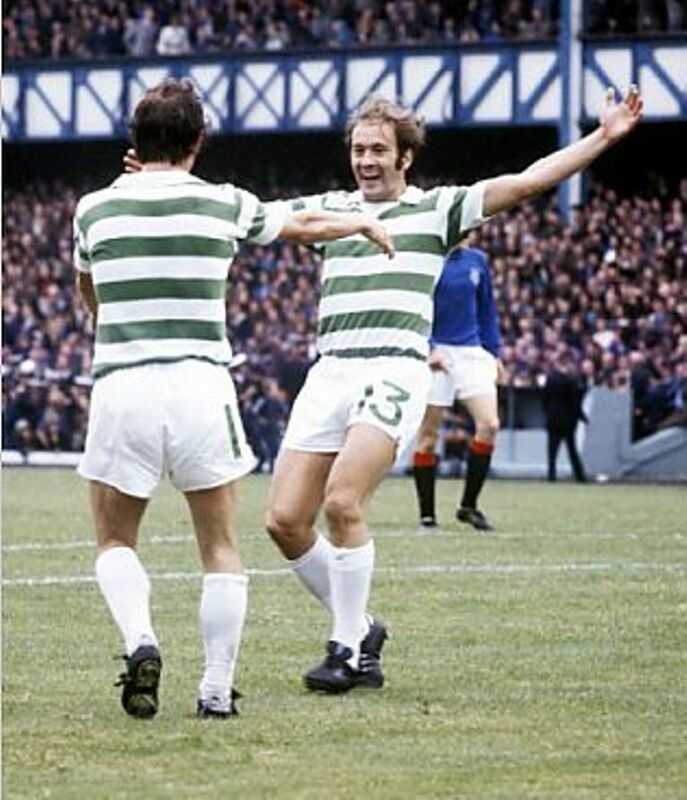 Celtic were on an unbeaten run of 31 games domestically and were strong favourites although Hearts were having a fine season and fancied their chances with Mike Galloway, John Colquhoun and John Robertson all scoring regularly. After a goalless first half, Hearts took the lead under very controversial circumstances. Brian Whittaker send a hanging cross towards the Celtic goal and Dave McPherson definitely impeded Celtic ‘keeper, Pat Bonner, as the ball bounced into the net. The Hearts fans were in raptures but Celtic now moved up a gear. Paul McStay was in the form of his life at that time and he showed why he was worthy of being named as Scottish player of the year. 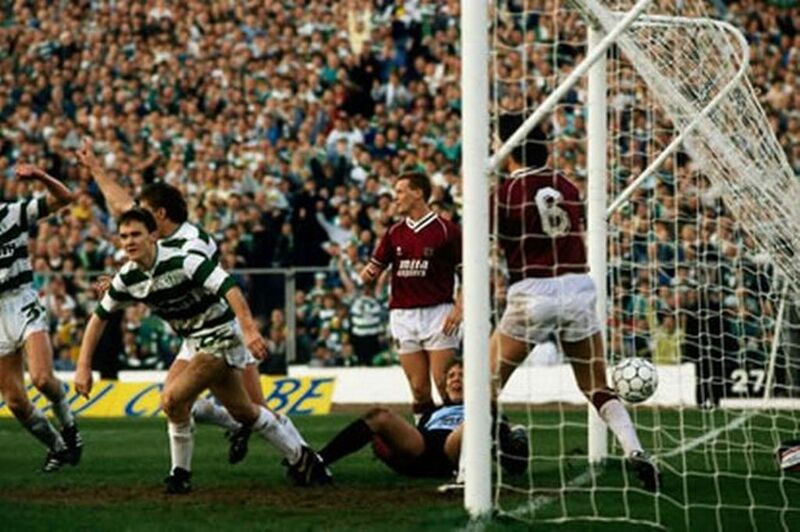 Attack after attack stemmed from McStay’s midfield efforts as the ‘Maestro’ inspired his team mates around him. Frank McAvennie had been a vital part of Celtic’s success that season but (in his own later admission) he had a howler and missed three terrific chances he may normally have scored easily. As time wore on Celtic’s frustration started to grow and Billy McNeill threw on Mark McGhee as a late substitute for Joe Miller. McGhee had an excellent scoring record against Hearts and their defence was now unsettled by his mere presence. 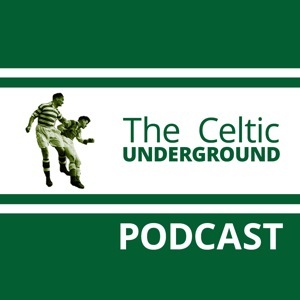 Despite a lot of good play Celtic still couldn’t find a way past the Hearts’ rearguard. There were just two minutes remaining when Celtic finally made the breakthrough. An in-swinging corner from Tommy Burns was missed by Hearts’ keeper Smith and as Roy Aitken miskicked, the ball fell to McGhee, who swivelled and found the net with a low shot. It was something of a miracle that he scored as press photographs (see below) showed that there were 10 Hearts players blocking his road to goal. Celtic fans were still celebrating and anticipating a replay when the Celts stormed forward again in injury time. 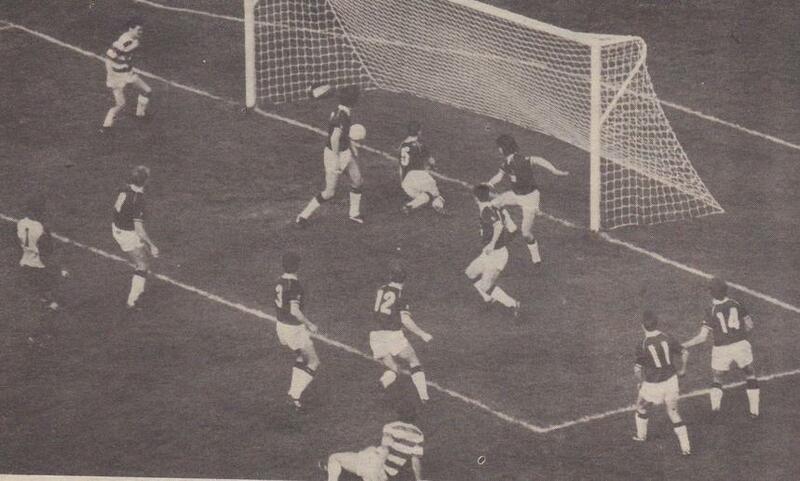 Billy Stark’s throw found McAvennie who lobbed a high cross towards goal. McGhee challenged Henry Smith who failed to clutch the ball and as it fell, Andy Walker lashed a shot high into the net. 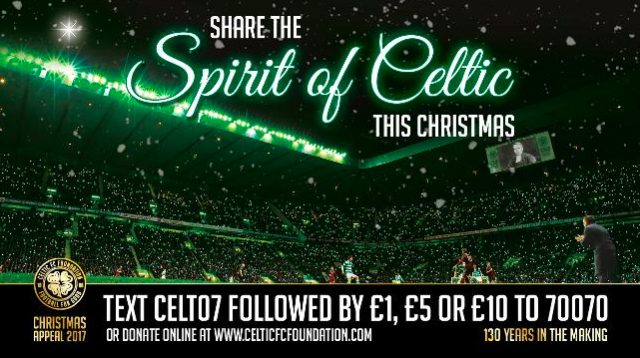 The Celtic fans who made up three quarters of the crowd went mad with delight and the players mirrored those feelings of joy on the field of play. Within seconds the game was over and Celtic had prevailed in one of the most dramatic fashions that old Hampden had ever witnessed. Hearts’ fans would claim later that McGhee had impeded Smith but they knew well that it was less of an obstruction than the challenge McPherson had put in on Bonner which had allowed Hearts to open the scoring so, in that respect, justice had been done. There is a footnote to this story. As the Govan Emerald supporters bus was travelling back from Hampden they got stuck on a tight corner in Dumbreck. As fate would have it a Rangers supporters bus was returning from Cappielow, where Graeme Souness’ expensive imports had lost 3-2 to an already relegated Morton team. The buses slowly passed each other at the turning and it remains the only time I can recall Rangers fans on a bus covering their hands with embarrassment from seeing gleeful Celtic fans on another bus, much to the hilarity of the Bhoys on the Emerald. It was that kind of day.